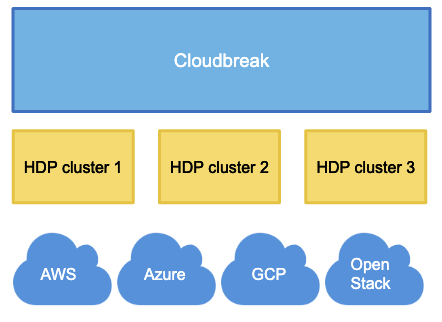 Cloudbreak simplifies the provisioning, management, and monitoring of on-demand HDP and HDF clusters in virtual and cloud environments. It leverages cloud infrastructure to create host instances, and uses Apache Ambari via Ambari blueprints to provision and manage Hortonworks clusters. Cloudbreak allows you to create clusters by using the web UI, CLI, and REST API. Clusters can be launched on public cloud infrastructure platforms Amazon Web Services (AWS) including AWS GovCloud, Microsoft Azure, and Google Cloud Platform (GCP), and on the private cloud infrastructure platform OpenStack.